Maybe you've been considering lost opportunities in your youth, remembering how you always dreamed of becoming a lawyer. You finished college and life happened. Maybe you started raising a family, but one thing led to another and you never got around to continuing your education. Is it too late? Are you ever too old for law school? Many would tell you no. As the economy continues to struggle—and it will always continue to have its ups and downs—more people are going to law school later in life. 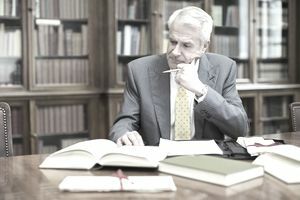 A growing number of law students are in their forties and some are even older. You're never too old to return to any school. Many older students find legal employment and older law school graduates have been recruited into all legal sectors. Starting—or going back to—school later in life presents unique advantages and disadvantages. If you think you're too old for law school, consider these advantages of going back to school for a graduate degree later in life. Older workers tend to have other major commitments, such as full-time jobs and raising their families. This can make going to law school a real challenge. But it doesn't have to be. More options exist today for older students than ever before. Many law schools offer evening programs and part-time programs. Online learning is exploding and more and more educational institutions are offering this option. Older students bring other talents to the table than just what they've learned in school. They've often developed a diverse range of transferable skills from their earlier careers. Law schools seek variety in their incoming classes and your life experience can give you an edge in the admissions process. Life experience is often appreciated by employers as well. If you have experience that relates to the job you're seeking, be sure to highlight it in networking discussions and job interviews. Research shows that employers view older workers as more mature, reliable, stable, honest, and committed. Older graduates are more focused and grounded. They know what they want in a career and from an employer. Maturity can be an advantage in both the law school admissions process and in a post-graduate job hunt. Older workers are less likely to struggle with waking up at the crack of dawn to commute to work, and they're usually less inclined to challenge established dress codes by wearing short skirts, revealing clothes, or other inappropriate attire. They might also be more reliable and responsible simply because they know their families depend on them. All these factors can tip the sale in your favor when you're applying to law school and after you've earned your degree and passed the bar. Don't automatically write off going to law school without giving it some serious thought.